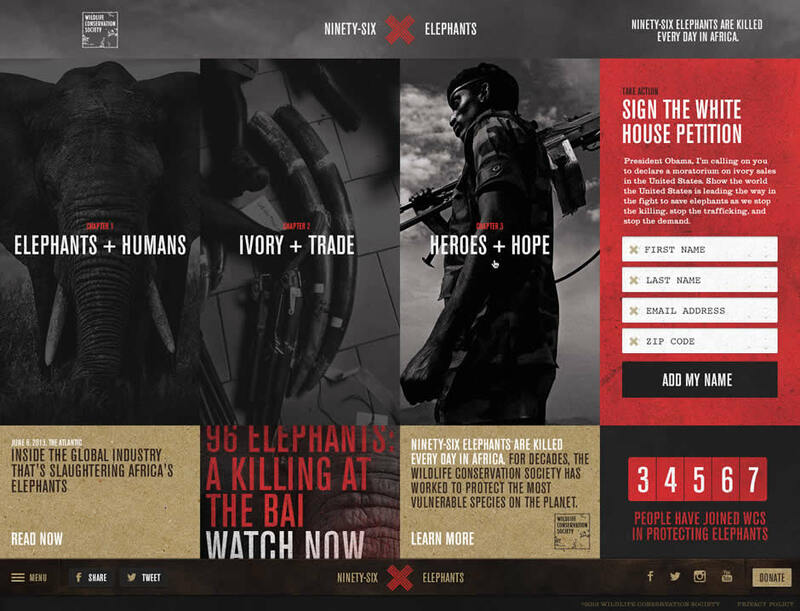 We were excited to see 96Elephants.org, a site we built with the Wildlife Conservation Society, take home the Gold in the Public Service category, the Best of Interactive Award, and the Best of Public Service Award at last night’s American Advertising Awards-DC gala. There were a total of 647 entries from 87 DC-area organizations. 96 Elephants tells the story of the impact the ivory trade is having on Africa’s forest elephants — 96 elephants are killed every day for their tusks. To create awareness of this devastating trend and spur readers to act we designed a site that features key messages, coupled with powerful visuals, to deliver a motivating narrative. The site’s cinematic three-part structure takes the user from awareness of the epidemic to empowerment and action. It was an incredibly rewarding experience working with the Wildlife Conservation Society to build a site with exemplary design and development — all in an effort to help stem the ivory trade around the globe and protect this noble species. Receiving these awards as a top DC digital agency is just icing on the cake. Visit the site to take a look at the work, and check out our case study to get the behind-the-scenes story of how we created 96Elephants.org. The American Advertising Awards Competition is a three-tiered national competition conducted annually by the American Advertising Federation (AAF), its chapters, and districts, and is the advertising industry's largest and most representative competition for creative excellence. The Gold Award is given in recognition of the highest level of creative achievement in a category, and the "Best of" Award is given for what the judges panel believes to be the most outstanding work in a category that is worthy of special recognition.